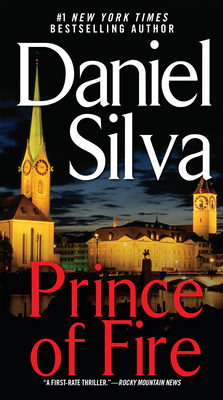 This is the fifth volume in Daniel Silva's Gabriel Allon series. I am reading them in order and was pleased to find Prince of Fire to be the best and strongest one yet. Gabriel Allon is an Israeli and a part-time assassin for Israeli intelligence, known as The Office. His cover and other passion is as an art restorer. In the earlier volumes the reader learns of his past and how he came to be a spy for Israel, how his son was killed in a reprisal by Palestinian terrorists that put his wife in an institution. Gabriel Allon carries enough loss and sorrow to break a man. Prince of Fire opens with a massive explosion in Rome. Investigations by The Office reveal that Allon's cover has been blown and he is pulled back to Israel and put into full time service. An intricate plot and a fuller history of the Israeli/Palestinian conflict make this a completely absorbing read. As always, I feared for Gabriel's life. It is only knowing that there are 13 more books in the series that kept me confident he would somehow come out alive. In fact #18, The Other Woman, was published just the other day. Despite everything, something good finally happens in the personal life of this fearless and competent assassin. I experienced a deeper understanding of the conflicts in Israel than I had before. I think these books give a more balanced picture than do the news reports. They explain from both the Israeli and the Palestinian sides the complexities that make it seem so insoluble. I have lately been slowly making my way through the fourth volume of Will Durant's Story of Civilization: The Age of Faith. I was reading the section on Islam, 569-1258 AD during the time I read Prince of Fire. The conflicts between Islam and Judaism go back much father than most people realize today. It is undoubtedly too much to ask that current world leaders should study this history but it would surely help if they did. I agree that one gets more complete history lessons in this series than what we get from the evening news or ever got from a history class. Yes one does Carmen and it is good history to know. We are definitely in agreement that this is the best one in the series so far which gives one hope that later ones will be even better. I am glad there are still so many left to read and that he is continuing the series. I'm always impressed with how much reading you accomplish throughout the year!! I'm sort of envious really :-) and you read such a diverse selection of books too. I enjoy reading your book reviews. Thanks. I just like reading better than any other activity. It is good to know you enjoy my reviews. I am glad we connected in the world of book blogging! I wish I could get through the series more quickly because I really want to see what he is doing these days. But I guess I will plod along and read them all in order.